Wire Management Grommets are used extensively on office and computer furniture to eliminate the clutter of wires and cables. Our range of Grommets offers several shapes, styles and finishes, and can be coordinated to match the color of your desk surface. Standard Color: Most Round Grommets available in the following colors: Black, Putty, Walnut, Light Gray, White. 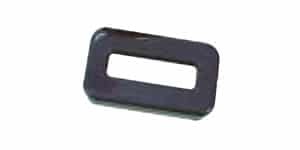 Standard Color: Most Rectangular Grommets are available in the following colors: Black, Putty, Walnut, Light Gray.